⊕ Superseded by Built in bookcase, part the third, 07 Nov 2006. Measure twice. More detailed plans. 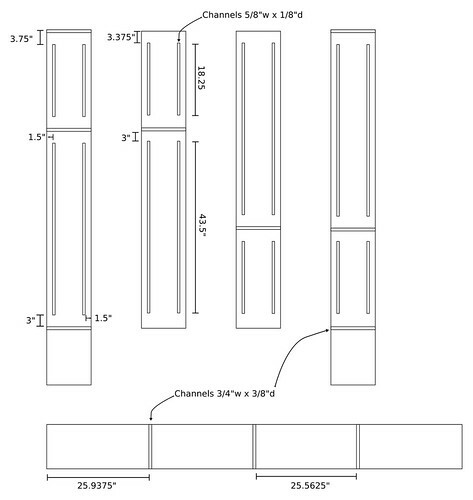 With a combination of Perl and Inkscape, I coded up some more detailed plans for the bookcase. 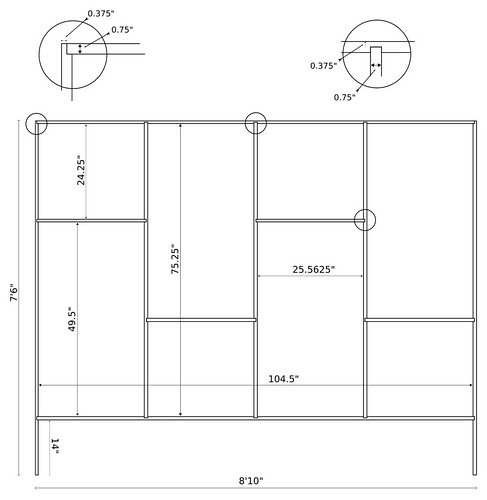 These are scale plans, though after resizing them for display, I don't know exactly what the scale is. To give the bookcase some architectural interest, I'm going to router most of the joints. I also need to carve channels for the metal strips that hold clips to support the adjustable shelves (not shown in any of the diagrams so far). The SVG diagrams for the front and router detail images are also online. Next stop: the home center to see about buying a router. After you get your router, be sure to spend a few minutes to build yourelf a little jig. You've got lots of rabbets and lap joints to cut, and doing them free-hand will not be fun. Also, since you're going to be cutting grooves for metal strips, you might want to consider a router kit that includes a plunge base. And don't forget clamps - they're the secret sauce of woodworking. And of course, those would be rabbet and dado joints, not lap joints. I've never seen any books 49.5inches high Norm. Is it 3/4" solid timber, 'cos I can see it sagging unless it's pretty solid, when full of books! Agree with Chuck though on guides. My favourite is a guide clamp from Trend (UK). http://www.trendmachinery.co.uk/clampguides/ though I'm sure you can find similar.